The ICC website has a steady audience who visit day to day for updates on activities. There’s incredible interest during important events such as the opening of a trial (5 x normal). What do users think of the ICC current website? The most frequent word used to describe the current ICC website was frustrating. The other words (and the answers to other survey questions) show the ICC website has a passionate and loyal audience, who are often thwarted in the tasks they must complete. How likely would you be to recommend the website to your friends? 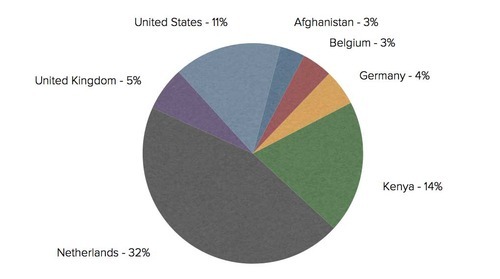 Visitors from 213 different countries. Very different needs, different technologies – must try to provide a consistent experience. These different views show how tricky it is to pin down where your users’ locations. Visitors change if you look at the most recent month. 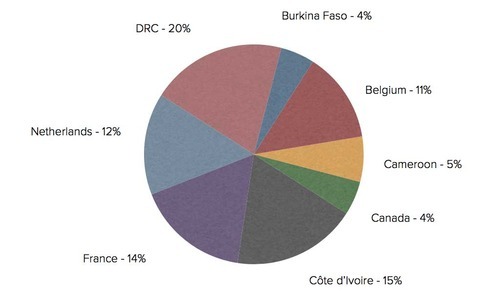 Interest from different countries ebbs and flows according to the activities of the court. The French version of the website currently serves a small but important audience. 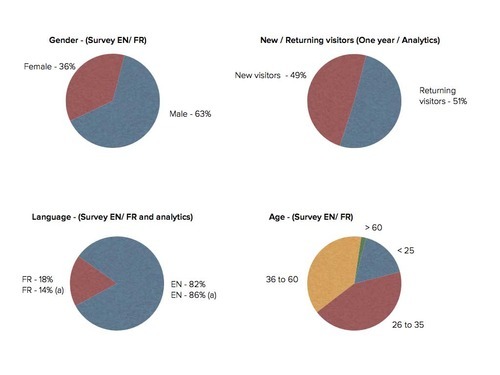 Fairly even gender split and even divide between regular users and new visitors. Well over half the ICC website users are under 35 years old (according to the survey results). 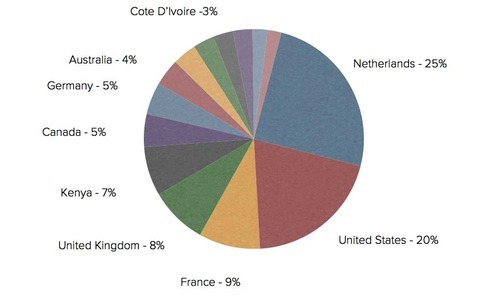 The French website accounts for less than one fifth of visits. ICC website users are highly educated: nearly 70 per cent have a postgraduate degree. Lots of legal professionals, NGO professionals, journalists and diplomats, but also a lot of students and the general public, ie people who answered “other”. In case you are interested “other” included: intern, accountant, retired civil servant, clergy, private investigator, admin assistant, freelance translator, crime victim. 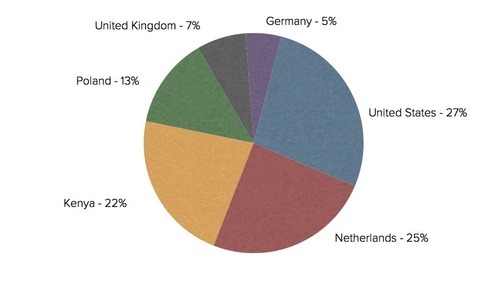 ICC website users spend a lot of time online. 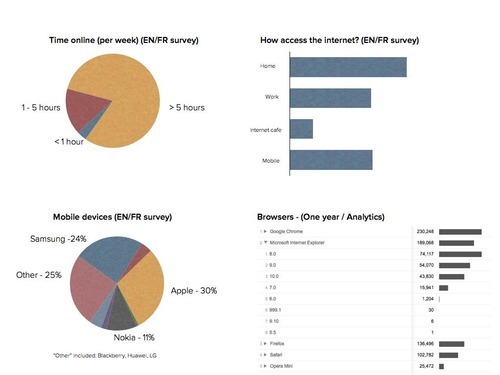 Many of its users live online, ie over five hours per day. They access it at home, at work and on the move. The browser chart (impossible to read below) shows Chrome is at the top, followed by IE (IE7 still gets used but IE6 has really dropped off), Firefox and then Safari. Most of the traffic comes either directly or from search. Social referrals are low at the moment. 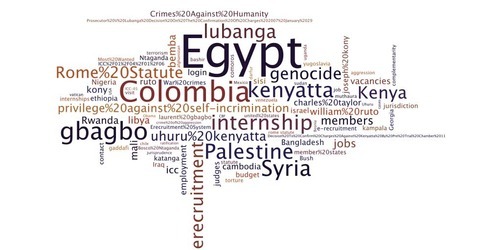 “Egypt” is the top search term for the year along with “Columbia” suggesting lots of interest in where the ICC could or could not operate. 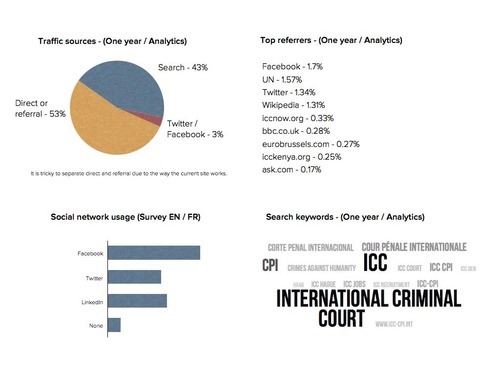 “Syria” is the top search term for September 2013 backing up the conclusions over the year (previous slide) that lots of interest in where the ICC could or could not operate. Very little content currently serves this need. Thanks for making it to the end of this report. We hope you found it useful. You can download a pdf version (2.3MB) from Scribd if you prefer. We will be posting information in the coming weeks on this blog about how we will use this research (which this post provides only a quick snapshot of). If you have any questions about this user research or the project in general, please contact Public Information and Documentation Section.